UpToDate publishes Practice Changing UpDates that highlight important, potentially practice-altering updates across all specialties of medicine. We also highlight important, specialty-specific updates for each of the 21 specialties that we cover in the What's New section of our website. These updates are shared FOR FREE on our public website so that all clinicians (not just UpToDate subscribers) can have access this crucial information. Subscribe today risk-free for unlimited access to more than 9,000 evidence-based recommendations for care! If you're not completely satisfied, cancel your subscription within 60 days for a full refund in US Dollars. 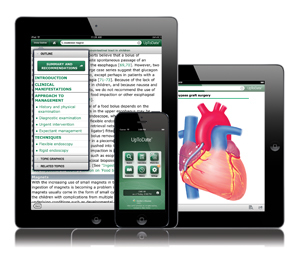 New Mobile Apps for iPhone, iPad, and Android™ devices are designed to answer your clinical questions FAST! UpToDate is accredited by colleges, associations, and authorities from around the world. See the many features of UpToDate through our product demo. iPhone and iPad are trademarks of Apple Inc., registered in the U.S. and other countries. Android is a registered trademark of Google, Inc.